Do you know that we’re more attracted to people who make eye contact and smile than those who don’t? Sales manager Nick Marsh, 26, did. 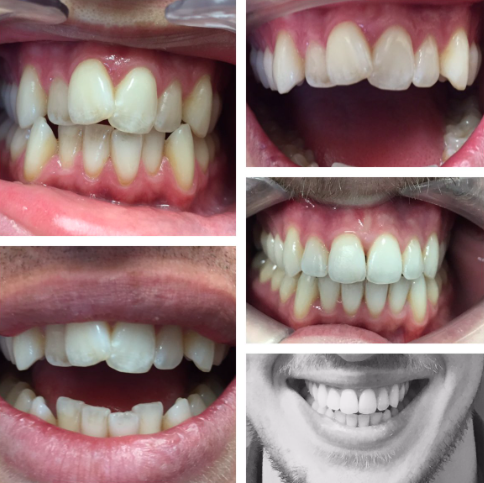 He recently joined the increasing number of adults seeking cosmetic teeth-straightening treatments to remedy their crooked teeth, correct an uneven bite and fix other aesthetic issues they face every day with the alignment of their front teeth. For Nick, from Alderley Edge in Cheshire, who never had braces as a child and now in his 20s, he could see the benefits of a straight, white smile. With more and more evidence that a straight smile boosts opportunities in our career as well as in our personal life, the creation of easy-to-clean aligned teeth has never been more in demand. And Nick believes the cosmetic treatment has certainly made a difference for him. He opted for Cfast – it stands for Cosmetically Focused Adult Straight Teeth – because he was fed up with the fact that his smile was letting him down. Having done his research, Nick settled on the Cfast system because it simply focuses on those all-essential front six teeth that show when you smile – plus, it can produce aesthetically pleasing results in as little as eight weeks. ‘My previous expectation kept me away from getting braces, which would have meant a year of wearing what would have been very visible – plus, I would have needed teeth out. I had been toying with the idea for several years and had actually been for a consultation before but the idea of having teeth extracted put me off the idea. His chosen clinic was Poynton’s Wish Dental in Cheshire and found its practice principal, Tom Owen, – who was recommended by a friend – ‘very approachable’. He says having Cfast treatment affected his speech very little. In fact, within 18 hours of having it placed, he was presenting to a room of 50 colleagues. Nick says: ‘No one in the crowd noticed I had a brace on, even when I was speaking to them one on one afterwards. As for eating, he says ‘it only affected my diet for the first three or four days at the very start. Included in the cost of the treatment, Nick also had teeth whitening. He says he would definitely recommend Cfast to anyone considering teeth straightening. ‘I’m no longer self-conscious about my teeth. I can actually have photos where I am happy to smile. And, has it boosted his confidence? Using a tooth-coloured wire and clear brackets, Cfast is a minimally invasive treatment that is comfortable, safe and affordable and gently straightens the front teeth that show when you smile. However, it is not always suitable if specialist orthodontic treatment is required. As with any teeth-straightening treatment, you will need to wear a retainer to support your teeth in the new position. Cfast’s SOLID invisible dual retainer ticks the boxes for those looking to ensure they keep their new smile forever. After treatment, it’s also worth asking your dentist about teeth whitening to complete that smile makeover.